We are having a pre-convention dinner Thursday night at 7:00. The dinner will be at Yu Shan Chinese restaurant, located at 14553 Bothell Way NE, Seattle. If you would like to come and have your own transportation, just leave a comment here letting us know. If you need a ride, please send your phone number by email to chair [at sign here] potlatch-sf [dot here] org and I will get back to you. I will be leaving from the convention hotel at 6:30 PM Thursday and can take along anyone who is there. Online registration for Potlatch 21 is no longer available, nor is pre-convention purchase of banquet tickets and T-Shirts. At-the-door memberships are still available for $70. As are a limited number of banquet tickets and T-Shirts, on a first-come-first-served basis. Well, we are down to the one week mark. Seven days of waiting and then forty-eight hours of intense discussion, tom-foolery, food, drink, swapping ideas, and seeing people you only get to see at Potlatches. Are you excited? We are. Of course we are getting pretty tired as well: putting on a convention is hard work and the last few days are the hardest. Please take some time during Potlatch to help us out by volunteering. Our biggest need for help during the convention is in Hospitality and at the Registration Desk. Also we need people who will be available before and after the con for set up and tear down. If you can work at one of those jobs send email to chair [at sign here] potlatch-sf [dot here] org and let us know what times and for how long you will be available. The Program Schedule is finished and can be found on our blog here. Updated directions for getting to the convention hotel are available on our blog here. The amazingly talented F. Baer has, again, designed a tour-de-force T-Shirt for us. Get a preview of her design on our blog here. The banquet menu is posted to our blog here. Pre-registration and sales of T-Shirts / banquet tickets closes on Monday, February 20th. If you don’t have your membership (or T-Shirt or Banquet Ticket) yet, go to our ‘Join Potlatch’ page and make yourself whole! Want to follow us on Facebook? We are there as ‘Potlatch Convention‘. Don’t forget to tell your friends you are going to Potlatch and encourage them to join you! If you don’t have your banquet ticket yet, there is still time to get one before the convention. At Potlatch it will be first-come/first-served. Banquet tickets are available for pre-order from our ‘Join Potlatch’ page. ALERT: There is a major street construction project just finishing up near the hotel, although the work is finished on Taylor Street in front of the BWEI. As of this writing the parking across the street to the west is not accessible, but the project is scheduled to be completed on 2/24/12, our first day! It can be tricky from Interstate 5 until you’ve done it once. Take the Mercer/Fairview Exit (north or south bound) from I-5; at the bottom of the ramp, turn right on Fairview while staying in the farthest left hand lane; bank around to the right and then turn immediately left at the next light onto Broad Street; stay on Broad in the left lane for about ½ mile, passing under two overpasses; there will be a left-hand turn lane at Taylor (at a Power Station), turn left onto Taylor and the hotel is directly on your left. Another ALERT: As of this writing, these directions are correct, but there is a MAJOR construction project, which affects this entire corridor that could get in the way. Mercer ramps are occasionally closed and Broad Street is closed in the opposite direction of the above route, so beware changes we cannot predict. From Aurora southbound, turn right at Denny and right onto Taylor, then north on Taylor. The Executive Inn has a large underground parking lot, which costs $15 for hotel guests. There are also lots all around and on-street parking (see above), which is free after 8 PM and on Sundays. The hotel connects with the elevator for loading and unloading cars, etc., without going through the lobby. TAKE SHUTTLE EXPRESS (directly to the hotel). This will cost $36.00 for one person, $8 for a second person, $3 for additional riders, and will usually take about 20 minutes. After claiming your luggage, follow the signs “To Ground Transportation” to the third floor parking garage; they are located near the Ground Transportation Center. For you to return to the airport, you will need to make an advance reservation a day before your departure; call them at (425) 981-7000 or at 1-800-487-7433 or go to their web site. TAKE A TAXI. This will cost about $43 to the hotel and, due to a City law, $32 back to the Airport with possible gas surcharges. TAKE METRO and the new LIGHT RAIL. Our new light rail system runs between Sea-Tac and Westlake Center downtown. From there you’ll need to take Metro to the BWEI. Call them anytime at (206) 553-3000; tell them where you are and where you want to go, and they’ll tell you how to get there. Or check their Web site. This year the talented Fredrika Baer has surpassed herself with a T-Shirt design reminiscent of the Mayan Calendar. (You know 2012 is the last year of the Mayan Calendar, right?) My first reaction when I saw this? 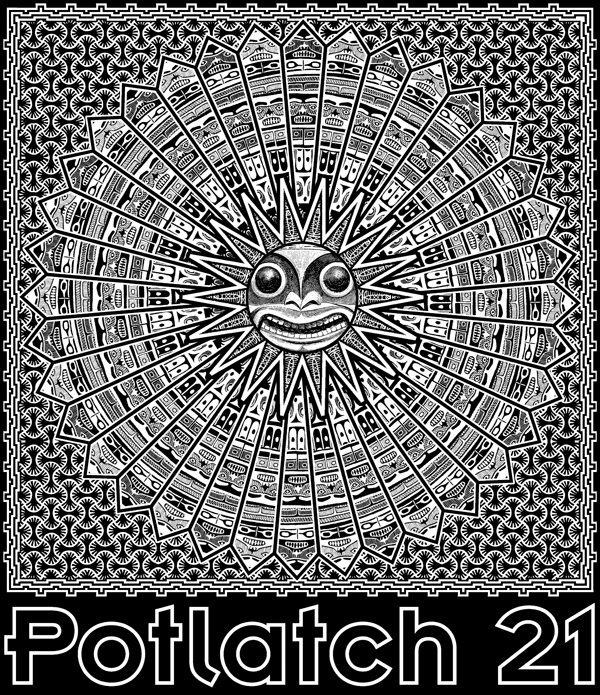 If you want a Potlatch 21 T-Shirt your best bet is to pre-order. We are only printing a limited number of shirts and after the pre-orders it will be first-come-first-served (with the sizes available) at the door. To pre-order, go to the ‘Join Potlatch‘ page and fill out the form as if you are buying a membership, but only click on the button for the T-Shirt. This allows you to pre-order a shirt even if you are already a member. If you aren’t a member, then buy a membership while you are at it. And, if you don’t have a banquet ticket, pick up one of those too. Just a note about some parking issues near the hotel. If you are staying at the convention hotel, parking is $15 a night. If you plan on parking on the street, Seattle is now charging for those spots during the day and will tow after 1:00 AM. Also, there is construction in progress across the street from con hotel which is blocking nearly all the spaces on the block for that side of the street. Clarion West is holding two Winter One-Day Workshops in Seattle. One, taught by the talented Richard Paul Russo is on Sunday, February 5. The other, taught by the fabulous by Kat Richardson, is on Sunday, March 4. The cost is $125 per session. Full-time students who participate will pay a discounted fee. Attendance is limited to 12 students; first come, first serve. So sign up now or miss out! Note: Potlatch supports Clarion West with an Auction, a ‘Taste of Clarion’ writer’s workshop, and other activities. 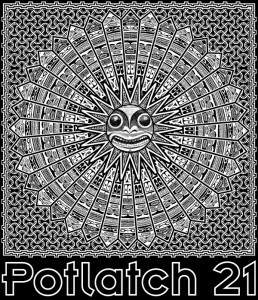 If you aren’t a member of Potlatch 21, join now!